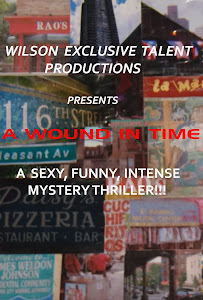 A WOUND IN TIME: APRIL IS JUST AROUND THE CORNER!!!!!!!!!!! APRIL IS JUST AROUND THE CORNER!!!!!!!!!!! Looks like it could be a wrap this Spring! At least if I continue to save my pennies with 3 months to go... So far it looks promising that in two weeks of filming we can wrap production. A Los Angeles distributor reached out to me regarding the possibility of international presales. The followup can take some time as they are busy making the rounds at the festivals. Sundance is in session... So grateful with a patient, and dedicated cast. They make my job sooo easy! Meantime, I am gearing up to begin rehearsals for the full production of my trilogy of stage plays this Summer. There will be a few familiar faces from "A Wound in Time" on the stage. It is going to be a very busy year...Happily!